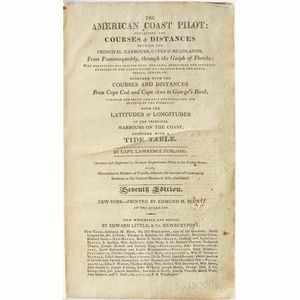 Furlong, Lawrence & Edmund March Blunt (1770-1862) The American Coast Pilot. 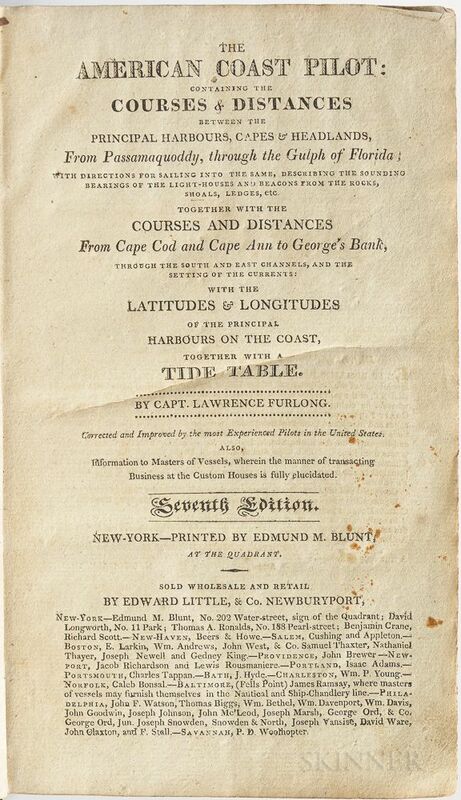 New York: Printed by Edmund M. Blunt, [June 1812]. Seventh edition, octavo, illustrated with ten full-page and five folding plates (most folding plates with tears, bad folds, and other damage, one torn with loss of more than 50%), with publisher's advertisement on last leaf, [A]4, B-Z4, Aa-Pp4, sig. 1-sig. 8; lacking text leaf Y2 (page 179/180); cancel slips pasted to pages 186 and 187; bound in full contemporary sheep, very worn, ex libris, Samuel Lumbard, with his signature and stamp, also signed by William H. Reynard of New Bedford, text printed on blue tinted paper, spotting and stains throughout, 1/2 inch burn hole through back cover with damage to final four leaves, 9 1/4 x 5 1/2 in.